News at Spencer Public Library: National Library Week! National Library Week is a national observance sponsored by the American Library Association and libraries across the country each April. It is a time to celebrate the contributions of our nation’s libraries and librarians and to promote library use. 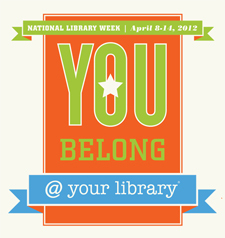 National Library Week is April 8th to April 14th this year. During National Library Week, Spencer Public Library will be offering a few extra services to show how much we appreciate your patronage. Join us for free coffee every day and free popcorn in the afternoons on April 9th to 14th! Grab a bag and fill it with books off our sale table for only a dollar! Guess how many bookworms the librarian ate, also at the front desk. Closest guess wins the jar of gummy worms! Check out the display case for a special “Guess The Librarian” quiz, filled with baby pictures of all your favorite librarians! You can turn in your answers at the front desk to be entered in a drawing for a $10 Carroll’s Bakery gift certificate. Don’t forget to join us for two special programs during National Library Week! We will be having a special PEEPSHI Teen Program on Monday, April 9th at 2:00 pm and a Star Wars Party on Saturday, April 14th at 2:00 pm!